The Simbo Rig provides yachtsmen and women with a comprehensive sail management system based on the flying of identical twin jibs with their higher cut clew. This enables the short-handed skipper to sail efficiently on all points of the wind with minimum foredeck work, controlled from the security of the cockpit. Simbo Rig which is an acronym for Simple Bow Rig, may be of particular interest to sailors who are not only sailing larger and more powerful yachts but on longer passages, often involving many weeks at sea. The merit of the rig is that it enables the crew to sail efficiently and safely, dead downwind without resorting to coloured sails; with the Simbo Rig, the working sails are always set which enables a skipper to make an immediate course correction to avoid collision, i.e. semi-submerged container unit, or to return upwind to retrieve a MOB. This sail management system permits you to complete a passage or season with just the one suit of sails, no matter whether sailing to weather, bearing away on a reach or running dead downwind. Apart from the raising and stowing of the whisker poles, no further foredeck work is required and with in-mast mainsail and jib furling, one person can control the rig from the security of the cockpit through day and night, in fair or foul weather without necessarily calling upon off-watch crew. Assuming of course, that the yacht is under the control of a reliable auto-pilot. The identical jibs are hoisted up the twin grooves of a furling forestay on a single halyard. On the wind, the sails fly together with no appreciable additional wear over a solo jib. 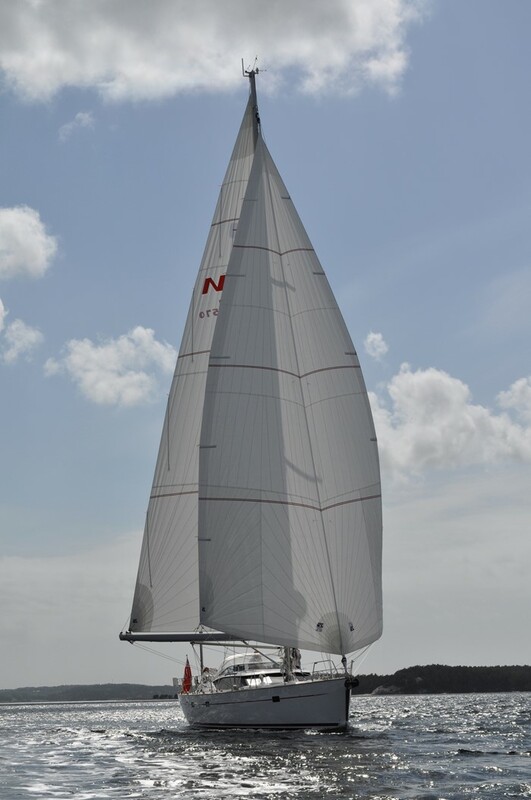 The jibs and inmast furling mainsail in the attaching photographs, were constructed in dimension polyant’s hydranet woven cloth which is a hybrid of woven polyester with a spectra ripstop. On the wind, the twin jibs enable you to rest the upwind sail on its downwind partner to re-run the sheet from the clew, from outside to inside the cap shroud for a tighter sheeting angle; in the same way, you can also run an otherwise loaded jib car up the track without, in either case, incurring flogging sails or loss of boat speed. On tacking through the wind, the upwind leeward jib/sheet is eased to rest on its downwind twin to leave just the downwind sheet to be released on coming about. Once through the wind, the new downwind jib/sheet captures its upwind partner and, trimmed to the new course, the upwind jib sheet then takes over final tweaking. On reefing or striking the jibs, both sails furl around the forestay in the same way as a solo jib. However, in strong winds it may be preferable for larger yachts with greater sail areas requiring powered furling, to always furl the jibs from around the leeward bow to enable the skipper to luff the sails and reduce the pressure on the furling mechanism, rather than furl them from across the foredeck directly into the wind. As both sails have their own set of sheets there is double the quantity in the cockpit but this can be simplified by their being colour coded. The system excels when the yacht bears off to a run. The twin jibs separate to their respective side to create a powerful cloud of sail in harmony with the mainsail, to power the yacht downwind. With the mainsail eased to 45-degrees off the centre line, the wind is directed around the mast into the windward jib which together with its own accumulated wind, is redirected into the leeward jib that would otherwise have been blanketed by the mainsail.To expedite a gybe, simply haul and release the mainsheet/sail onto the new course, leaving the whisker poles and jib sheets undisturbed. Prior to bearing away to a run, one can raise the weather whisker pole on its boom-lift with attaching fore & aft guys and the weather lazy sheets from the two jibs run under the whisker pole's retractable bolt. This enables the twin jibs to be separated immediately on coming on to a run. If remaining on that tack there is no need to hoist the leeward whisker pole as it is the redirected wind from the weather jib that sets the sail. On subsequently requiring to gybe, the leeward whisker pole can be set without loss of drive, by restraining the sail by its weather sheet whilst rigging the leeward whisker pole on its boom lift with fore & aft guys, following which the sail’s retention can be transferred back to the poled out leeward sheet. A more relaxed approach to rigging the whisker poles is to furl away the jibs on bearing off to a run, hoist the whisker poles and then unfurl the sails to their respective side. However, If running dead downwind, i.e. with the true wind no more than 25 degrees off the stern, the twin jibs will set without the whisker poles by running the jib sheet cars forward on their track to tighten the jibs’ sheets/leach down on them to cup the sails. The twin jibs can be reefed downwind by furling the sails from their respective side around the jib foil. If hit by a squall, one can immediately dump 50% of the sail area by bearing onto the wind to back the weather jib to leeward; the jibs can then be reefed under the lee of the mainsail before separating them again on returning to the run. If running in severe weather when the mainsail has been struck in favour of the twin jibs, it is consoling to know that the remaining sail area can be reduced by 50% merely by backing the weather jib to leeward when one can then continue the run with the jibs poled out in tandem to leeward. Following on from this, the twin sails can be reefed in unison or struck without incurring any foredeck work, and all from the security of the cockpit. The whisker poles can be retained on a reach until the apparent wind is approximately 60 degrees off the bow when the leeward sheets are released by withdrawing the restraining bolt at the W/P claw. The poles can then be stowed up the mast or left in situ for later. On the run the dominant twin jibs lift the bow to create course stability and avert a broach; when taking this into consideration with the ability to reef the headsails downwind, a well found ocean yacht should be able to run with the Simbo Rig up to gale force wind without undue concern. As there is no pressure of significance on the mast from the leeward W/P and the mainsail's boom only opposes the weather W/P at 45 degrees, downwind roll is reduced to a minimum. The main attributes of the Simbo Rig are that it permits the skipper to sail on all points of the wind with the one suit of sails with minimum foredeck work and most importantly, power downwind without compromising the working rig which is always on hand to deal with unforeseen circumstances. For yachts with no forward lowers, the whisker poles can be jointly stowed up a forward mounted mast track and lowered like wings, to pre-marked settings on their boom-lifts with attaching fore & aft guys which ensures that the W/Ps are at right angles to both the yacht and the mast. For yachts with forward lowers, the whisker poles are manually stowed up the mast and subsequently rigged between the fore and aft lowers by attaching the inboard end to the hinged male mast fitting. In either case, carbon whisker poles are to be preferred with a length of 50% of the jib’s foot, measured from tack to clew. On Googling YouTube and searching Simbo Rig, a video of a yacht’s twin jibs being unfurled to their respective whisker pole in 10 Kts TWS can be viewed, in which you will notice the immediate acceleration in the yacht’s speed once the headsails are set. View the photo gallery with descriptive captions by following the link below.